The Facebook Like button. Not since the invention of the word “like” has “like” had so much impact on the human psyche. Forget friendships — gaining approval by people online via the Like button is the new popularity gauge, leaving those with less likes than others feeling a bit inferior and even lost. And since Facebook, Bing and trends tell us we all need to be liked, the only cure for our complex is well, more likes. So, let’s take a look at this crazy Like button phenomenon, its various uses and why you need to be liked to survive in the age of online marketing. Aside from the like that people strive for on their Fan pages (more on the value of a Facebook fan here), two variations of the Like button exist. The first we’re going to talk about is the Like button that integrates with a website and allows Facebook users to endorse a Web page’s content or an object such as an item for sale, a person, a restaurant and more. With this button, you can also use what’s called Facebook’s Open Graph Protocol to specify what type of content the person is liking, if it represents real-world objects (movies, celebrities and more, versus just content). Facebook gives a list of categories that you can specify. The content is published in a person’s news feed on Facebook, and therefore, in the news feeds of people that person is connected to. It shows the user liked the page and links back to the original source. For items a person can like that represent real-world objects, once someone endorses it, it follows the same protocol as above, but also treats this liked item as a Facebook page. What that means is the Web page now shows up in the liker’s (if that’s even a word) interests and activities on their Facebook profile. Companies can use this data to target ads to these people on Facebook, if they wish. The item will also be searchable within the Facebook search bar feature. The other variation of the Like button is the act of liking within Facebook. The Like button within Facebook allows content to spread even more (including the items that show up in news feeds from your website that someone endorsed). The reason why more likes within a Facebook post are significant is EdgeRank. EdgeRank is Facebook’s algorithm for serving up “top news” in a person’s news feed. There are two views for a person’s news feed in Facebook, found in the upper right-hand corner of the feed): “top news,” based on the EdgeRank algorithm applied to updates from your network and “most recent,” showing the most recent updates from people within your network. Facebook tell us that the default landing tab is Top News if you haven’t logged in for a while or set it to “most recent.” Top news is the status updates that have received the most interaction based on criteria in EdgeRank. But before we dive into the significance of this, let’s discuss how EdgeRank works. One TechCrunch article gives a good analysis of how EdgeRank operates. Keep in mind that EdgeRank is similar to Google’s algorithm in that the factors are not entirely divulged. However, the TechCrunch post points out that the action of creating an Object, say a status update, automatically turns it into an Edge, which is how it gets in peoples’ news feeds in the first place. So that said, an item outside of the Facebook realm, whether it’s a Web page, article, person, place or thing online, can be thrown into the Facebook community and Top News algorithm for more exposure just by being liked by someone. 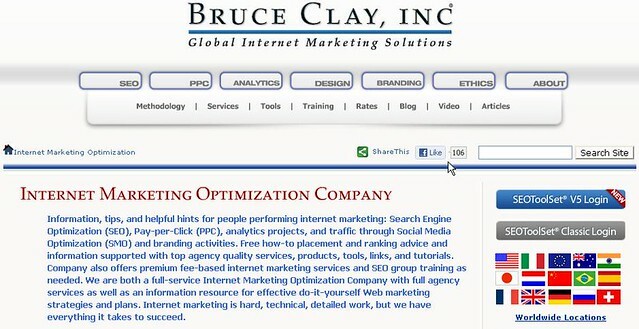 I stumbled upon a white paper by Buddy Media via Search Engine Land during my research. The paper shares tips based on research on what factors go into the EdgeRank algorithm. According to Buddy Media’s research, each type of Edge carries a different weight in the algorithm depending on what it is. For example, the report states that Facebook assigns a higher weight to images than other types of content such as links. The report also points out that video carries a weight score that alone can influence the EdgeRank. So what does the Like button have to do with this? The Like is a part of the EdgeRank algorithm that can put your items in the Top News feed. Plus, likes factor into other metrics such as the percent of feedback on a status update in your Facebook Insights. The feedback percentage is calculated by taking the total number of comments plus likes, divided by the total number of impressions (the raw number of times the update is shown to users; this is different than post views, which can be found by going to Insights > Interactions). In addition, likes typically beget more likes. According to a presentation by Justin Osofsky at Facebook in 2010, the type of people who like items visit more URLs from Facebook and have more friends. And voila! More exposure online. Back to the Like buttons you plug into your site. Like buttons have the ability to include Meta data, just like a Web page. I won’t get into the nitty gritty here, because Greg Finn put together a step by step post on how to optimize Facebook’s Like functionality and sums it up well. But, it’s worth a mention that if given the option to optimize and test variations of the way information is presented to users in their Facebook news feeds when something is liked online, you should probably take it. Optimizing the Like function on your Web pages or objects includes action items like customizing how the title of the liked item will be presented; what type of object it is, such as a celebrity or restaurant (I mentioned the supported objects earlier in the Open Graph Protocol section); what image will be shown in Facebook for that item; and much more. Google and Bing have two very different approaches to search results as it relates to the Facebook like button. Both Google and Bing have said that social cues factor into search. But just last week, Bing announced Facebook likes will actually affect the results and rankings when signed into Facebook. Bing delivers a more personalized search experience by using the interests shown by your friends. Now you won’t miss potentially interesting information that may have been buried deep within the search results. Bing will surface results, which may typically have been on page three or four, higher in its results based on stuff your friends have liked. And, how often do you go beyond page one of the results? And, it’s not just friends in your Facebook community Bing is taking cues from. Bing takes likes to the next level by including results with liked items from people who aren’t in your direct network of friends. Bing shows well-liked content, including trending topics, articles and Facebook fan pages, from sites across the web, to help you dig in and quickly find exactly what you’re looking for. Looking for a great recipe? Now when you search for a recipe site, you’ll see what recipes people have liked on that site, allowing you to cut through the clutter and find the perfect recipe for dinner. On the other hand, while Google’s algorithm takes into account social cues and serves data from places like Twitter in its results, the Facebook like in particular has not been confirmed as part of the algorithm. Some believe that the Like doesn’t factor into Google rankings for many reasons; one reason being a Google employee weighing in on the matter in a Google Webmaster Help thread, exposed in this post by Barry Schwartz at Search Engine Roundtable. I suspect Google is too busy working on its own social search with the likes of Google +1 to make rival Facebook a factor in its algo – but who knows. Search Engine Land recently featured a post on how Facebook says likes and social plugins help websites. The numbers, from Facebook, look pretty impressive; their studies show that implementing the Like button increased revenue, traffic and time on site for several of its users. And aside from the hard numbers (I mean, how do you top the Like button directly generating revenue? ), maximum online exposure, brand engagement and potential rankings in the search engines – all the benefits we’ve spoke about today – are an advantage of implementing the Like button. Privacy issues: All the information a person has ever liked is stored in one place: Facebook. This leaves a person’s “personal” information exposed to whomever would like to view it – including potential advertisers and other parties that may use it to their benefit. Site speed: Some say the Facebook code used to implement the Like button can slow down your site’s load time, and as many of us know, site speed is a factor in Google’s algorithm. Dictatorship: K, I don’t know if that’s the right word, but it’s the closest I could come to describing the concept that you can’t reap the benefits that the Like button has to offer unless you participate in Facebook. Shouldn’t all businesses be able to benefit from the same rewards of social search and endorsement buttons online without having to be a part of some exclusive club? And there you have it; the Like button in all it’s glory. We’d love to hear what you have to say about it – the good, the bad and the ugly. the google+ will pk facebook like button. During your research did you find anything that would resolve this issue that I’m having: I have recently changed my root domain of my website and have lost all of my “likes” on my articles! While it seems silly, the social validity of my content has in just a few hours went from legit to nil!! If you have any resources on this matter that would be great! Hey no problem at all; love discussion. My initial reaction is that the more options a person has, the greater the chance that someone is going to act on it. Feel free to shoot me an e-mail for further discussion any time, Jeremy! Thanks for the quick responses and additional thoughts. To avoid burying your thread, I’ll stop now, but I do appreciate the extra time. Sounds about right to me. The difficulty for marketers is to know what actions to promote users to take. What is going to generate the most additional traffic from FB and SERPS? The answer consistently seems to be…. it depends. Not knowing what “call to action” to recommend is the most difficult part of SM marketing right now. Technically, how I understand it, is that they both perform the same function in the end — adding the article to and growing its exposure in the Facebook news feed. If an article is liked on its original Web page, it gets thrown into Facebook’s news feed. It could potentially just sit there until someone likes it while in Facebook — in which case the EdgeRank algorithm will help give it more exposure (interaction with the post is what helps that). On the other hand, if you just copy and paste a URL directly into Facebook, you’re still waiting for the same thing to happen — people to interact with it for more exposure (so it can become Top News). I don’t know that liking it from its original Web page gives it any more weight in the EdgeRank algorithm than copying and pasting. However, liking something directly on its Web page does hold more weight in the SERPs in some cases (like in the case of Bing). So technically, liking an article on a Web page performs double duty: increases the chance of that Web page’s rankings in the SERPs, in some instances, and throws it into the Facebook community for further exposure. Jessica – Yes! I have never read that before. Is there a study or more information on the difference between “liking” an article from a blog or adding it directly as a link on FB? Hi, Jeremy — thank you! Are you referring to liking an article on a Web page versus liking it in the news feed in Facebook? This is a great breakdown. With Hubspot and SEOmoz both running evaluations on the impact of “like,” I did not expect to read anything new. I do not remember ever seeing that “like” within Facebook carries more weight than directly from an article. I know these things change, but I would love to hear more about that. Interesting suggestion, Thomas, thanks :) Hope to hear from you again! I’m suggesting if the like button load time is affecting the overall performance of sites, developers should find a way to cache the buttons showed from the server side and not depend on facebook the load the contents from their server. This way only the like action will result in contacting the facebook servers. The count of likes can be cached by the server itself and shown to the user. Great article !! Thanks for the tips. Helped us a lot. Hi Ken — thanks for your comment! When you say fake followers, do you mean like spammers on Twitter or … ? [Anyway thanks for the] detailed writeup. Good stuff. Thank you for expanding on that point. Good data to know. Both implementations of the Like button, I’ve heard, are iframe (even the XFBML version) — is that right? This is very true and bears repeating. Adding 3rd-party content (let alone in an iframe) is a real performance killer. The standard implementation adds about 500ms to a typical page, which might not sound like a lot but is actually about a quarter of the total 2-second page load time threshold, after which users will start to bounce for performance reasons. Loading the Like button asynchronously makes a big difference and is recommended. As is measuring page speed with tools like Yottaa.com’s free web performance measurements. Shall we analyze the “send” button as well? Coz I think “send” button have more closer relationship compared to “Like” button between senders and receivers. Wow, thanks for verifying, Kent! Facebook Dislike button is a scam. I don’t see “Dislike” button on my Facebook, but maybe some hackers can make it happen. 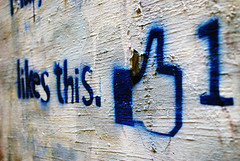 The “Like” button is a powerful weapon in the marketing strategies. I heard today that there is a “Dislike” button. This could be very dangerous indeed. Thank you! And that’s interesting! I wonder if there’s a difference in people’s minds about the personal preference of a “like” and endorsing something through a “recommend” it — seems like the latter comes with a lot of pressure! Do you have a link to that data by chance? Would like to check it out. Thanks for your comment! Great analysis. Just wanted to share test results that Jonathan Trevor (creator of Yahoo! Pipes and YQL Abstract) shared yesterday. They tested “Like” and “Recommend” on Polyvore.com. “Recommend” tanked. Turns out, nobody wants to recommend anything. “Like”, on the other hand, was a hands down winner. There are pro and con (from my point of view) if Google really factor Facebook “Like” into Google algorithm. Pro – It makes people engage and communicate even more online, the virtual network or virtual community even bigger. Con – Internet marketers have a lot of work to do. I am thinking what would happen if Google really factor Facebook “Like” into Google search engine algorithm….we have to post quality content on Facebook as well? Have to even engage more with Facebook fans? More work to be done…. As Jessica said, it may happen, then we have to fine tune our marketing strategy again. Ted, thanks for the link — good stuff! Very happy you enjoyed the article. 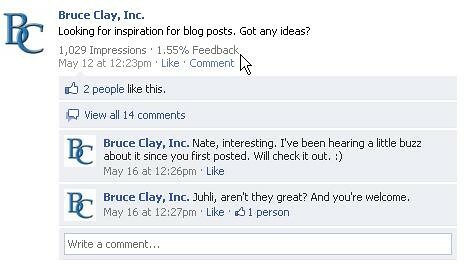 :) I’m going to share the link you gave me on our Bruce Clay, Inc. Facebook page — we’re having a discussion on ROI of the Like button right now. An extremely comprehensive review, very helpful, thanks Jessica. The SEOMoz folks recently did a presentation where they updated their correlation metrics, and for Google, Facebook likes for a page were more highly correlated with rankings than *any other factor* – including mozRank and unique domains – really shocking actually. It’s in the presentation here, check out slide 33.